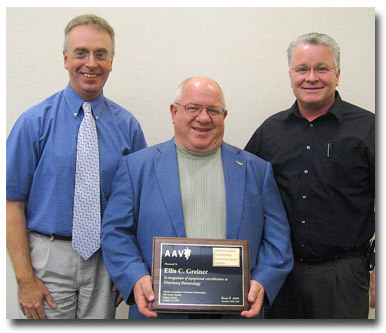 2009 AAVP Distinguished Veterinary Parasitologist Award (sponsored by Merial) – The AAVP Distinguished Veterinary Parasitologist Award recipient for 2009 is Dr. Ellis C. Greiner. Dr. Andrew Peregrine (left, Awards Committee) and Dr. Doug Carithers (right, Merial LTD) presented the Distinguished Veterinary Parasitologists Award to Dr. Ellis C. Greiner (center). Dr. Andrew Peregrine (Left, Awards Committee) and the 2009 AAVP Student Award Winners. 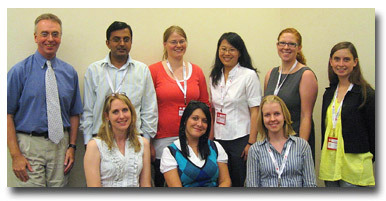 Back row (left to right): Vijayaraghava Rao, McGill University; Ulla Anderson, University of Copenhagen; Alice Lee, Cornell University; Stephanie Heise, Oklahoma State University; and Mette Larson, University of Copenhagen. Front row (left to right): Kelly Allen, Oklahoma State University; Amy Edwards, Oklahoma State University; and Alessia Guthrie, University of Guelph. 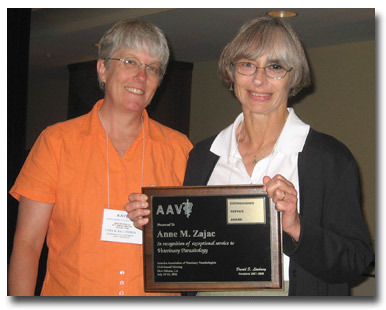 2008 AAVP Distinguished Veterinary Parasitologist Award – Dr. Anne M. Zajac (right) was presented the 2008 AAVP Distinguished Service Award at the 2008 AAVP meeting in New Orleans by Dr. Lora R. Ballweber (left), 2008 AAVP Program Chair and Vice-President. In addition to her numerous contributions to AAVP, Dr. Zajac is the senior author of the 7th edition of Veterinary Clinical Parasitology. Proceeds from the sale of the book fund travel grants for graduate students to attend the annual AAVP meeting.